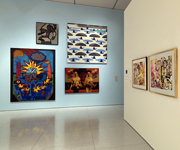 Installation view of the Smart Museum of Art, featuring works by the Chicago Imagists. While H.C. “Cliff” Westermann spent much of his mature period in rural Connecticut, he maintained correspondence with artists in California and influenced the careers of a younger generation of artists known as the Chicago Imagists. Artists Jim Nutt and Gladys Nilsson will offer a person perspective on Westermann and his connection to the Chicago Imagists, while art historian and critic Dennis Adrian (A.B.,’57), a friend of Westermann’s, will moderate an in-gallery conversation. The discussion will likely touch on letter-drawings to Westermann by artists William Wiley, Ed Ruscha, Ken Price and a young Bruce Nauman. Free and open to the public. A Bike to Work Rally on Friday, June 19 is part of a five-month celebration called Bike Chicago 2009. 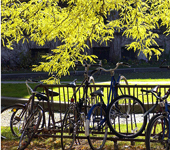 Riding a bike can help displace more than 238 million gallons of gasoline annually and reduce the amount of carbon monoxide released by vehicle emissions. The event challenges commuters to put down keys, step off the bus and bike their way to work. Fellow cyclists, local media celebrities and live bands will gather at Daley Plaza (Washington and Dearborn streets) in downtown Chicago for a full day of activities beginning at 7:30 a.m. The event is part of Bike Chicago 2009, a five-month celebration of Chicago’s commitment to become more bicycle-friendly and environmentally conscious. For more information, visit http://explorechicago.org.